Antique Quick Meal stoves can easily become the focal point of a country kitchen. The increase in the number of available stoves and stove parts gives individuals throughout the United States the chance to enjoy the fun and flare of cooking on a beautifully refurbished stove from the early 1900s. The origins of the Quick Meal stove were in St. Louis. John Rigen, a German immigrant, started a tin shop in 1850. He asked George August Kahle to be his partner in 1870 and together they formed a thriving business selling cooking stoves and washing machines. They called the cook stoves "quick meals" to reflect the added time convenience of using their product. Two family members joined their business and the foursome went on to form two companies - the Rigen Stove Company and the Quick Meal Stove Company. Quick Meal produced the stoves and Rigen distributed them. Both companies were extremely successful and eventually merged with six other companies in 1901 to form the American Stove Company. American Stove continued to produce and sell the Quick Meal stove. 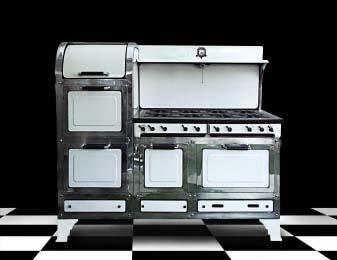 The gas-burning Magic Chef oven was introduced in 1929 as the Quick Meal Magic Chef stove. The growing popularity of the Magic Chef brand name caused the American Stove Company to change its name to Magic Chef in 1951. It is now possible to have a working, antique stove in your kitchen. There are a growing number of antique stove dealers throughout the United States who are taking old stoves and turning them into beautiful, functioning kitchen appliances. Some dealers, like Homestead Vintage Stove Company will give you the option to purchase the stove in its as-is condition or they will fully restore the stove for you. It is often possible to find an excellent price on a hard-to-find part or stove on eBay. However, you could also be surprised if what you end up with is not what you think you purchased. You can minimize eBay surprises by checking the seller's eBay reputation, requesting lots of photographs and buying from a stove retailer (not just a seller who is trying to get rid of a few spare parts). A well-qualified stove restorer usually has a long waiting list - sometimes up to a year. If you think you are going to need to have a stove restored, get on the waiting list as soon as possible. A company such as Homestead Vintage Stove Company usually has a year-long waiting list. Antique Gas Stoves has been restoring antique stoves since 1982 and is an excellent source for either restoration work on your stove or to purchase a fully-restored stove. They are meticulous in their finishing work, ensuring that all parts and finishes look as factory original as possible. Description of the part you are replacing such as color, shape, special markings, material it appears to be made from as well as any fabrication marks or holes. Photos of the place on the stove where the part will be placed. Antique Gas Stoves is another excellent source for stove parts. They specialize in the vintage 1940s and 1950s stoves, but their restoration of antique stoves also gives them excellent access to parts for the older stoves. The price of antique Quick Meal stoves is very difficult to estimate. It depends on the model, the age of the stove, the condition and what functional updates have been made during restoration. You can get a general idea of prices by referring to price guides and by looking at the stoves offered by online antique stove dealers. The value of the stove to you may not just be a specific price. Part of the value might be what the stove adds as the visual anchor to your country kitchen or the value of the memories of family holidays conjured up by the sight of the stove. Most stove restorers are also stove retailers and they share your love of the stove as a collectible, not just as a functioning kitchen appliance.